High quality Northland spring rural property listings included a 357 hectare Ararua farm milking 420 cows and also suited to finishing beef; and a 319 hectare coastal Mangakura dairy unit averaging 230,000 kilograms of milk solids per annum. As in other regions, purchasers are taking their time to respond. Land use change, from dairy to horticulture, has motivated several recent Northland transactions, and may do so again through summer. While the potential for nutrient leaching, and restrictions on land and water use that farmers are struggling to adapt to in other regions has not previously been a factor in Northland, that may change. Similarly, the threat of Mycoplasma bovis has been less of a concern than in other regions, though Northland’s farmers will also need to educate themselves about that risk during the summer. Several attractive Waikato rural properties were listed for spring sale. Among these, 286 hectare Grassy Downs, 23 kilometres east of Hamilton, was one of the most eye-catching, a widelyadmired sheep and beef breeding and finishing property, offered for sale for the first time in 60 years. Although that attracted plenty of attention, buyer interest elsewhere was muted, particularly in the dairy sector. Some potential purchasers are struggling to elicit support from financiers, the slipping payout forecast is leaving many feeling cautious and predictions of a dry summer are not helping. Spring sales figures for the region were comparative to the lowest on record. However, a similar pattern prevailed 12 months ago, which in the event served as a precursor to an active summer and autumn in the Waikato rural property market, so a repeat of that could be possible. Bay of Plenty kiwifruit continues to achieve capital gain, with premium gold orchards transacting in spring for prices approaching $1.2 million per canopy hectare, and buyers remaining eager. Green kiwifruit orchards are selling as high as $500,000 per canopy hectare. Only a shortage of willing sellers is holding the kiwifruit market in check. However, as elsewhere, the region’s dairy sector is subdued. Neither buyers nor sellers are prepared to act decisively without clearer market signals. These will come in due course and should serve as a tipping point for confidence. If so, the local market should engage more energetically. 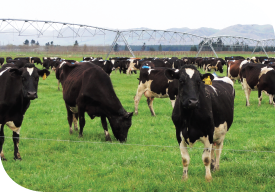 Several Rotorua farms were offered for spring sale, including drystock and dairy properties. Although buyers here are also taking time to commit, these may sell in the summer, which should encourage several additional farmers to offer property for autumn sale. Early in spring the rural property market in Taranaki, Wanganui, Wairarapa, Manawatu and Horowhenua was quiet. That changed as the season progressed and by early summer several good quality sheep and beef farms were offered for sale. Buoyant commodity prices and positive talk in the sector indicates excellent demand. Existing farmers and families seeking to expand their operations represent the dominant group of potential purchasers. Based on the opportunities offered by trees and bees, after a lull during recent months, demand for hill country properties has also returned. In dairy, there is also no shortage of farms listed for sale. However, due to the same uncertainty in the sector noted in other regions, associated with dairy consents and financial pressure, demand is unexceptional, which is unlikely to change before Christmas. With prospects for sheep and beef remaining positive, farmer confidence in Hawke’s Bay is high, and activity in the rural property market is following suit. Tahuna, a 580 hectare predominantly flat Waipawa property was one of several noteworthy Hawke’s Bay sheep and beef farms offered for spring sale. It changed hands in early November, one of the region’s first to do so this season, bought by a local farming family after a tender process that attracted plenty of attention, and solid competition. Additional listings are indicated, and further sales should eventuate in the coming months, though if the long-range forecast for a hot, dry summer with low rainfall eventuates, enthusiasm for the market may diminish. In the meantime, rural property value expectations and sale prices have remained consistent in the region for several months.